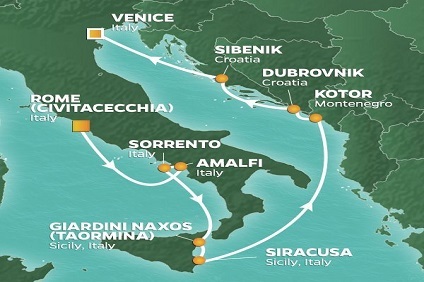 7 Night Cruise sailing from Venice roundtrip aboard Azamara Pursuit. 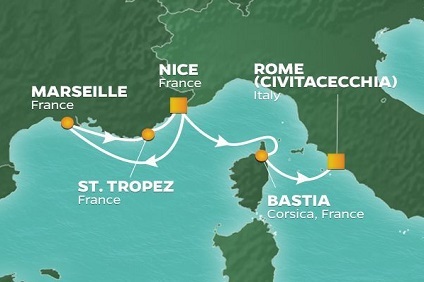 11 Night Cruise sailing from Venice to Rome aboard Azamara Pursuit. 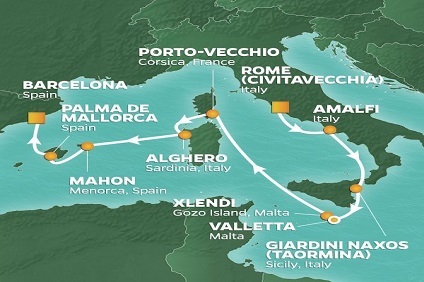 10 Night Cruise sailing from Rome to Barcelona aboard Azamara Pursuit. 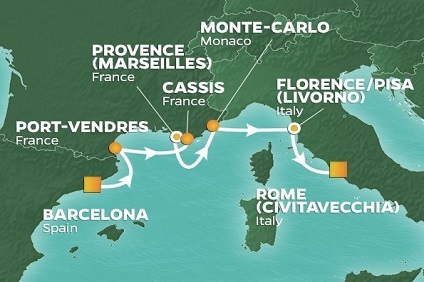 7 Night Cruise sailing from Barcelona to Rome aboard Azamara Pursuit. 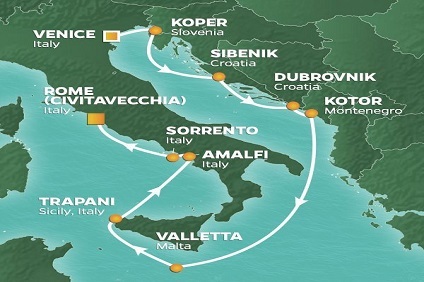 16 Night Cruise & Stay Pasta, Vino & Piazzas Cruise onboard Azamara Pursuit from Rome to Venice including 4-star stays in Rome & Venice PLUS Best of Tuscany in One Day Tour & Venice Walk & St. Mark's Basilica Tour! 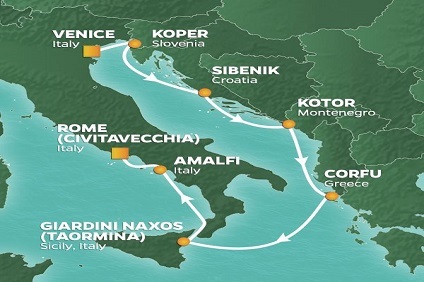 11 Night Cruise sailing from Venice to Athens aboard Azamara Pursuit. 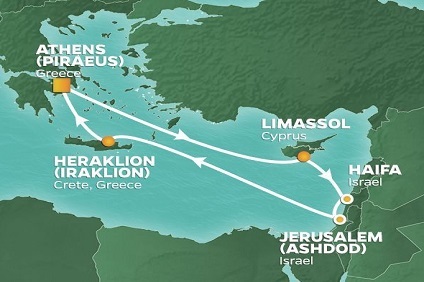 11 Night Cruise sailing from Athens roundtrip aboard Azamara Pursuit. 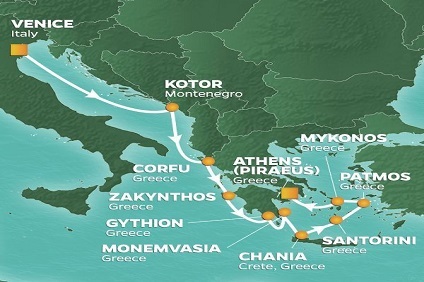 10 Night Cruise sailing from Athens roundtrip aboard Azamara Pursuit. 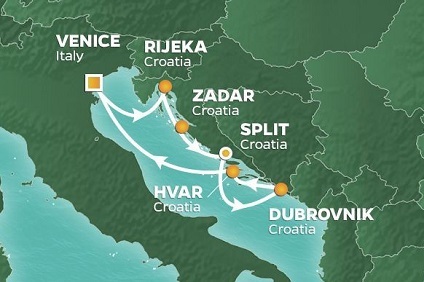 11 Night Cruise & Stay In Pursuit of Croatia Cruise onboard Azamara Pursuit from Venice return including a 4-star stay in Venice PLUS Absolute Venice Combined Morning Tour! 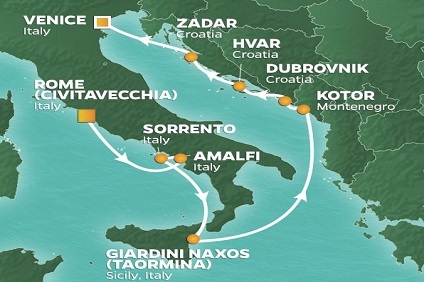 7 Night Cruise sailing from Venice to Rome aboard Azamara Pursuit. Stateroom Area:603 sq. ft. (56.1 sq m). Veranda Area:233 sq. ft. (21.7 sq m). Our largest suites have been transformed to feature contemporary design elements that create an elegant and organic feel. The design draws inspiration from nature—a sandy cliff, flowing river beds, exquisite white sand beaches, and rustling grasses. These luxurious accommodations feature a large living room with a separate bedroom, floor-to-ceiling sliding glass doors that open to your own private veranda, marble master bath, large flat-screen television, refrigerator with mini-bar, and many other amenities. Enjoy everything our Club Owner’s Suites have to offer, and of course, all of the pampering that comes with them. FEATURES: Spacious living room with a separate master bedroom Master bedroom with one king size bed and a 40” flat-screen television 55” flat-screen television in living room Marble master bath with tub and shower Dressing room with vanity and ample closet space Floor-to-ceiling sliding glass doors in living room and master bedroom Spacious 233 sq.ft. (21.7 sq.m.) veranda Refrigerator with mini-bar Thermostat-controlled air conditioner Direct-dial telephone with voice mail Writing desk In-room safe Hand-held hair dryer COMPLIMENTARY STATEROOM FEATURES: Luxurious cotton bed linens with duvet Terry bathrobes and slippers 24-hour room service Daily fruit basket Fresh-cut flowers Tote bag Use of umbrella and binoculars Shoe shine-service Turndown treats Daily news bulletin Complimentary Internet (235 minutes) Complementary specialty dining * Please note: Staterooms may vary in size and configuration from that pictured. Stateroom Area:478 sq. ft. (44.5 sq m). Veranda Area:173 sq. ft. (16.1 sq m). When you step inside your Club Ocean Suite, you step inside a large suite with elegant, contemporary décor. These suites feature new furnishings and wallpaper, plush carpeting, writings desks and more. With a large living room and a separate bedroom, and floor-to-ceiling sliding glass doors that open to your own private veranda, your suite will be a wonderful respite from your many experiences on land. Marble master bath and dressing room with vanity make it easy and comfortable to get ready for the day—or for an evening dinner out. Large flat-screen television, refrigerator with mini-bar, and other fine amenities add to the comfort of the suite. You’ll be spoiled by the attention to detail in these beautiful suites, and of course, all the pampering, too. FEATURES: Spacious living room with a separate master bedroom Master bedroom with one king size bed and a 40” flat-screen television 55” flat-screen television in living room Marble master bath with tub and shower Dressing room with vanity and ample closet space Floor-to-ceiling sliding glass doors in living room and master bedroom Spacious 233 sq.ft. 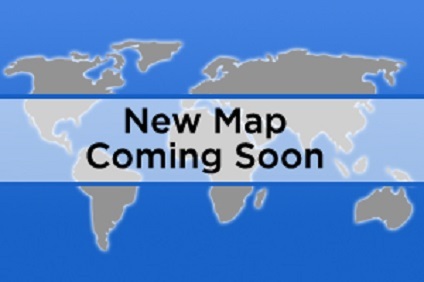 (21.7 sq.m.) veranda Refrigerator with mini-bar Thermostat-controlled air conditioner Direct-dial telephone with voice mail Writing desk In-room safe Hand-held hair dryer COMPLIMENTARY STATEROOM FEATURES: Luxurious cotton bed linens with duvet Terry bathrobes and slippers 24-hour room service Daily fruit basket Fresh-cut flowers Tote bag Use of umbrella and binoculars Shoe shine-service Turndown treats Daily news bulletin Complimentary Internet (235 minutes) Complimentary specialty dining * Please note: Staterooms may vary in size and configuration from that pictured. Stateroom Area:414 sq. ft. (38.5 sq m). Veranda Area:60 sq. ft. (5.6 sq m). Love the feeling of being at the spa but never want to leave? With our new Club Spa Suites, you won’t have to. Located next to the tranquil Sanctum Spa, our newest suites are the ultimate in contemporary design, comfort and pampering. With easy access to the Spa, open decks, swimming pool, our great restaurants—as well as our newest venue, The Living Room, the Club Spa Suites surround you with organic, elegant décor, and the finest, most soothing amenities. Suites feature comfortable sitting area, daily delivery of healthy snacks, Frette plush robes and slippers, and in-room spa music. For the ultimate in serene surroundings, the spacious glass-enclosed spa soaking tub and separate rain shower bring the outside in, with views to the endless seas beyond. Unique spa amenities are included, such as a complimentary “Nights in Private Places” experience for two and a spa credit to be used for spa treatments of your choice. The perfect place to get away from it all. Without being far from anything. FEATURES: Two lower beds convertible to one queen size bed Spacious glass-enclosed bathtub Separate rain shower Comfortable sitting area 55” flat-screen television in sitting area In-room spa music Floor-to-ceiling sliding glass doors Veranda Refrigerator with mini-bar Thermostat-controlled air conditioner Direct-dial telephone with voice mail Writing desk In-room safe Hand-held hair dryer COMPLIMENTARY STATEROOM FEATURES: Luxurious cotton bed linens with duvet Terry bathrobes and slippers 24-hour room service Daily fruit basket Fresh-cut flowers Tote bag Use of umbrella and binoculars Shoe shine-service Turndown treats Daily news bulletin Complimentary Internet (235 minutes) Complimentary specialty dining * Please note: Staterooms may vary in size and configuration from that pictured. 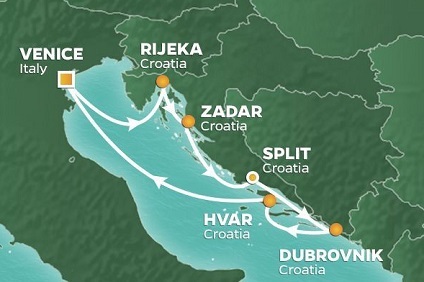 Stateroom Features All Azamara Club Cruises Suites include: English Butler service. Priority check-in and departure and unpacking and packing of luggage. Complimentary garment pressing for two items welcome sparkling wine and fruit basket, daily savories between 4-6 pm, in-suite afternoon tea service, in-suite dining from restaurant menus for breakfast, lunch and dinner. 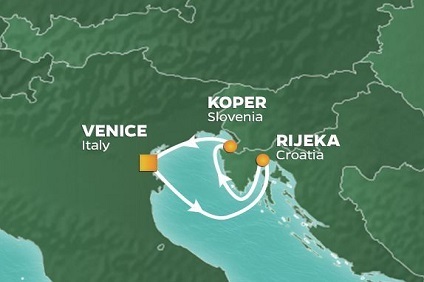 Complimentary seating throughout the voyage in specialty dining restaurants. Opportunity to book in-suite spa services (addtional charges may apply). One 375 mL bottle each of Stolichnaya Vodka, Bacardi Gold Rum, Bombay Sapphire Gin, and Johnnie Walker Red Label Scotch, plus cranberry and orange juice. W - Guarantee - Suite Two lower beds convertible to one Queen size. Spacious and comfortable sitting area with 55” flat-screen television. Roomy bathroom with shower, some also feature a tub. Floor-to-ceiling sliding glass doors, veranda, refrigerator with mini-bar, thermostat-controlled air conditioner, direct-dial telephone with voice mail, writing desk, in-room safe and hand-held hair dryer. (266 square feet; veranda 60 square feet). Stateroom Area:175 sq. ft. (16.3 sq m). Veranda Area:40 sq. ft. (3.8 sq m). Escape to a private retreat of polished style, featuring contemporary décor, luxurious linens, plush cotton robes and slippers, French bath products, fresh flowers, turndown treats, and 24-hour room service. STATEROOM FEATURES: Two lower beds convertible to one Queen size bed Comfortable sitting area with 40” flat-screen TV Veranda Refrigerator with mini-bar Thermostat-controlled air conditioner Direct-dial telephone with voice mail Writing desk In-room safe Hand-held hairdryer USB ports under bedside reading lamps COMPLIMENTARY STATEROOM FEATURES: Luxurious cotton bed linens with duvet Terry bathrobes and slippers 24-hour room service Welcome fruit basket at embarkation Fresh-cut flowers Tote bag Use of umbrella and binoculars Shoe shine-service Turndown treats Daily news bulletin * Please note: Staterooms may vary in size and configuration from that pictured. Stateroom Features Stateroom Amenities: Luxurious cotton bed linens with duvet, terry bathrobes and slippers, 24-hour room service, "About Rose" toiletries sophisticated luxury soaps and fine toiletries, welcome fruit basket at embarkation, fresh-cut flowers, tote bag, complimentary use of umbrella and binoculars, complimentary shoe-shine service, turndown treats, and daily news bulletin. Y - Guarantee - Oceanview Two lower beds convertible to one Queen size bed, some staterooms feature sofa bed, 40” flat-screen TV, veranda, refrigerator with mini-bar, thermostat-controlled air conditioner, direct-dial telephone with voice mail, writing desk, in-room safe, and hand-held hairdryer. Categories 04, 05, 06 (170 square feet) with picture window. Category 07 (170 square feet) porthole window. Category 08 (143 square feet) with obstructed views. Stateroom Features Stateroom Amenities: Luxurious cotton bed linens with duvet, terry bathrobes and slippers, 24-hour room service, "About Rose" toiletries—sophisticated luxury soaps and fine toiletries, welcome fruit basket at embarkation, fresh-cut flowers, tote bag, complimentary use of umbrella and binoculars, complimentary shoe-shine service, turndown treats, and daily news bulletin. Z - Guarantee - Inside Two lower beds convertible to one Queen size bed, 40” flat-screen television, refrigerator with mini-bar, thermostat-controlled air conditioner, direct-dial telephone with voice mail, writing desk, in-room safe and hand-held hairdryer. (158 square feet).